Good location, good price, clean room, wifi was very strong and worked good, wide variety of TV channels. Great location in the very center of the city. 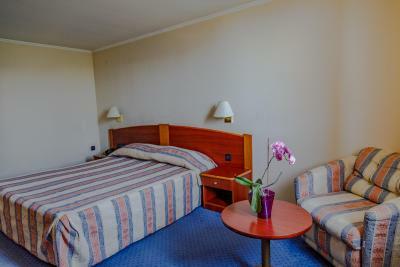 Comfortable and quiet rooms. Restaurant is the Happy Grill chain. Bathroom nicely upgraded. Hotel and furniture is classic Soviet luxury from the past. Location is close to center of town and easy to walk to attractions. The restaurant in the building is Happy and they have very nice cooking. The staff are very polite and responsive. The whole atmosphere was warm and comfortable. The staff are great and always ready to offer help. Hotel Orbita This rating is a reflection of how the property compares to the industry standard when it comes to price, facilities and services available. It's based on a self-evaluation by the property. Use this rating to help choose your stay! 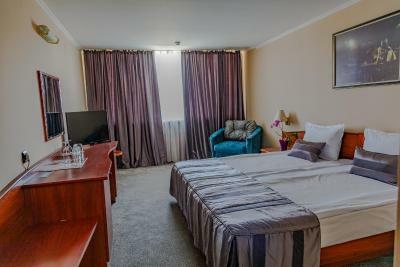 One of our top picks in Varna City.The centrally located Orbita Hotel is just a 4-minute walk from all Varna’s major administrative, educational, historic, and cultural landmarks and is just a stone’s throw from the Sea Garden and the picturesque beach, as well as the most popular restaurants, night clubs and bars. Just 2,700 feet from the beach in the picturesque central part of the city of Varna, Hotel Orbita provides guests an unforgettable stay in elegant accommodations. Orbita Hotel could be easily reached by car or public transportation from every point of the city including Varna Airport, Central Train Station, and Central Bus Station. Benefit from the 24-hour room service and the parking lot, which is 350 feet from the Orbita. The property is only 10 minutes from the Festival and Congress Centre and other important sites as The palace of Culture and sports, Theater “Stoyan Buchvarov”, Varna Summer Theater, The Opera of Varna, Roman baths, The Aquarium, Varna Cathredal etc. 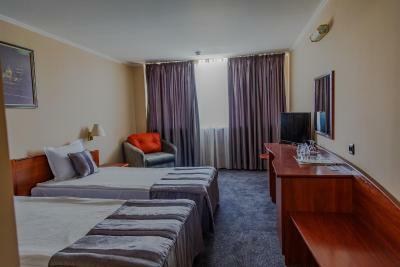 Orbita Hotel has rooms with a bathroom, air conditioning, cable TV, a telephone and a minibar. On the ground floor of the hotel our guests could enjoy a Happy Bar & Grill restaurant, part of the Bulgarians’ favorite restaurant chain which is open 24 hours. The hotel also provides safe, 24-hour room service, laundry and dry cleaning, minibar, free Wi Fi internet, information at the front desk, and business services. 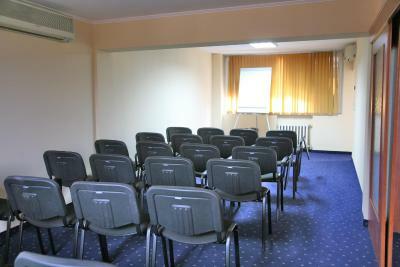 Conference facilities are also available for corporate events. When would you like to stay at Hotel Orbita? Air-conditioned room with a minibar and sitting area. Features a separate living room and bedroom. This double room features a mini-bar, soundproofing and cable TV. House Rules Hotel Orbita takes special requests – add in the next step! One child under 12 years is charged BGN 19.56 per night when using existing beds. All children under 12 years are charged BGN 13.69 per night for extra beds. Hotel Orbita accepts these cards and reserves the right to temporarily hold an amount prior to arrival. The hotel and all was smoking ? I was ordered NON SMOKING ROOM ? I am not recommended?? A bit of renovation would be great for this hotel. Also - shower can be not with curtain, but with plastic or glass sliding doors. Shower head was not working properly so water sprinkles on the floor and towel became excessive wet. Staff was not happy to replace the towel. Mini bar was with the problem..coolless! 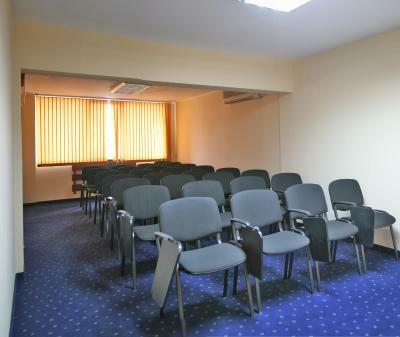 Excellent location close to central Varna and walking distance of great bars and restaurants,theatres and Sea garden. Pleasant and helpful staff.Spacious room which was very clean.Extra pillows and bedding and nice fluffy towels.Excellent value!Happy Bar next door was an added bonus especially if you want an English breakfast. No dedicated parking at all. Aging architecture.